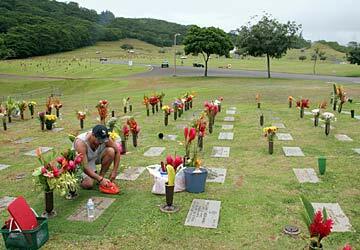 Daren Miyasato tends to the grave of his father at the Hawaii Veterans Cemetery in Kaneohe. Conditions at the 14-year-old cemetery have improved from earlier this year thanks to a $751,000 appropriation from the Legislature. The graves still sink after heavy rains, and people continue to plant their own grass on the grave sites of loved ones. But conditions at Hawaii State Veterans Cemetery in Kaneohe are improving, said Ed Cruickshank, state Office of Veterans' Services director. "We've come a long way," he said. The sprinkler system is still undergoing repair but is now operational. The patchwork of different grasses over graves is less obvious, because work crews cover barren spots with a green mulch that includes grass seeds and fertilizer. And it took just two days for workers to fill in graves that settled after the most recent heavy rains, said Miles Okamura, cemetery operations manager. Okamura said the sunken graves are filled in "as fast as we can get out there." Much of the work under way at the cemetery was made possible by a $751,000 appropriation from the Legislature to repair some of the deteriorating conditions at the 14-year-old cemetery. Some of that money became available July 1. The rest will be available next July. But work on the sprinkler system started in June with money left over from the previous fiscal year, Cruickshank said. The new money has allowed the Office of Veterans' Services to continue to repair the sprinkler system, buy topsoil to repair sunken graves and headstones, and purchase casket liners to prevent the graves from sinking. The cemetery will start using the casket liners as soon as Gov. Linda Lingle can approve some administrative rules changes for their use, Cruickshank said. The casket liners will be free for veterans and $231 for family members, he said. Work on the hillside and columbarium are scheduled for next year, Okamura said. Another reason for the improvements is there are more people available for the cemetery's maintenance. Just last year, there were just four groundskeepers on staff to maintain the cemetery's 123 acres. Since then the state Department of Defense has re-assigned maintenance workers from state armories to the cemetery. "On any given day we have five to 10 guys," Okamura said. And inmates from the Women's Community Correctional Center show up at least twice a week to help clear overgrowth. Okamura said there are about 6,200 grave sites in the cemetery, which has a capacity for 75,000. Between 35 and 45 people are buried at the cemetery every month, he said. Some days, there are as many as four burials. State Rep. Ken Ito lives across Kamehameha Highway from the cemetery. He said he sees more graves and many more people entering the cemetery, especially on holidays. Cruickshank said the grounds are also getting popular among people who walk for exercise. The next public ceremony at the cemetery is next month for Veterans Day. Cruickshank promises people will notice the improvements. "We don't fix the cemetery for Veterans Day. We fix the cemetery because it's the right thing to do and that's what we're tasked to do," he said.